It has been a little while since I last put fingers to keys and in the intervening much has indeed happened: we have made merry with the Christmas Bacchanalia and I have spent 14 hours, 3 minutes and 26 seconds running 97.5 miles to name just two, but as presaged by Alison, this week I will be mostly talking about the Brooks Serpentine New Year's Day 10k. I entered the race back in October when I had finalised my training as it fell nicely at the end of my 10k plan and while Alison had already run her mid-way training race of truth just before Christmas, she saw an opportunity to take part in the craic and maybe set a new PB for the distance and that is why on New Year's Eve we were in bed just after 10pm. We awoke bright-eyed and eager for the off on the stroke of midnight when Kent and London spontaneously performed a reenactment of Desert Storm. Lulled back to sleep by the shelling, gunfire and to the strains of avant-garde, abusive street theatre, I passed the time by imagining I was actually happily watching Jools Holland with a glass of fizz. 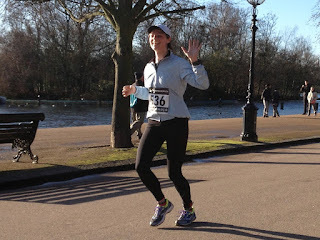 The race itself was, as the name suggests, run around Hyde Park and arriving with an hour to spare I was surprised how nervous I was feeling. We have both run a number of 10ks over the years and I am usually just excited - and also cold - but now there was a looming presence of expectation perched hawkishly over my peace of mind. The previous 3 months had been the most concerted training programme I had ever done and all the effort was about to be put to the test. 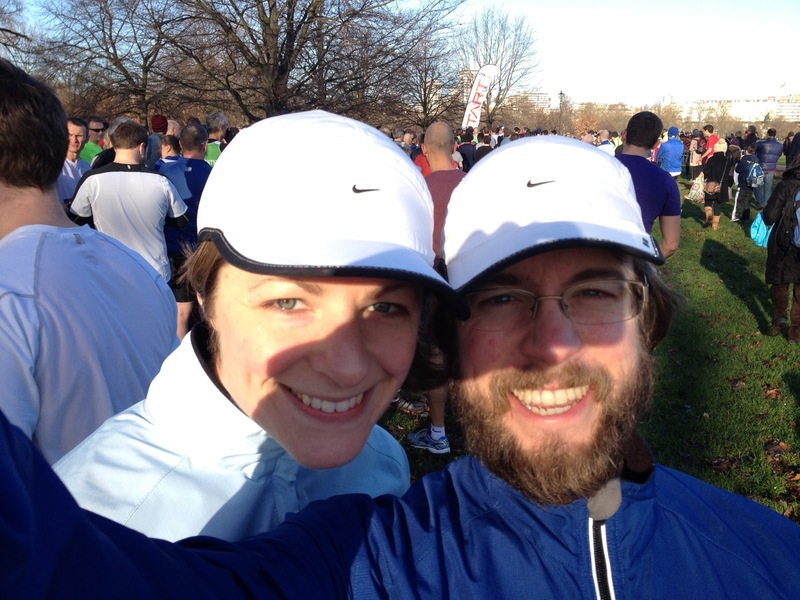 For the record, our previous bests for 10k were both set at the 26.2 Road Club's Valentines 10k held in Chessington every February and they were: Iain 53:42 set in 2007 and Alison 58:43 in 2012. The park was very fresh and the hand dryers in the cafe by the Serpentine were being heavily used by the 500 runners who had gathered to see in the new year with their feet. As we queued at the start, the main distraction was Winter Wonderland which in my memory consisted of a Ferris wheel and three sorry-looking sheds covered in cotton wool but which now appears to cover 40 acres of mud with an enormous cash-cow collection of tenuous 'Festive' attractions and a talking tree. The course was reasonably flat (Alison thought it was hilly), there was a nice mix of competitors and as the race organisers had banned headphones, the entertainment was provided by hordes of tourists alternating between asking the marshalls what was going on and getting in the way. I had planned the run at 8:19 min/miles and as is customary, despite experience telling me otherwise, I started too fast but as it was a 10k, you can sometimes get away with it and this was thankfully one of those occasions. So, Personal Bests all round, festive hi fives and here is Alison on the run in to the finish proving she clearly did not run fast enough as she is still smiling. The down side of these results is that we had to recalculate our training paces for the next 16 weeks off the back of them and mine are just insane!